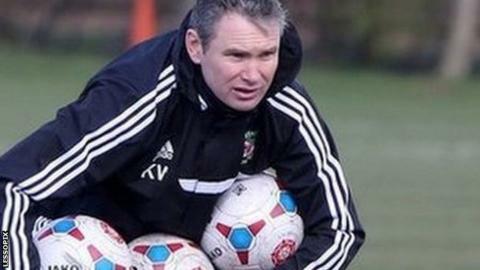 Wrexham have sacked manager Kevin Wilkin a day after they lost in the FA Trophy final to North Ferriby United. The Conference side lost on penalties at Wembley after a 3-3 draw, having been 2-0 up against their part-time opponents. First-team coach Carl Darlington and assistant manager Gary Mills will take temporary charge for Tuesday's Conference match at home to Dover. "This was an incredibly difficult decision," the club said. "But despite our cup successes, our main priority is promotion back to the Football League and we have not made the progress expected towards that aim. "We have therefore made the difficult decision that a change is needed." Goalkeeping coach Michael Oakes will assist Darlington and Mills for the Dover game. Wrexham are 15th in the Conference, having won five of their last 25 league matches. Wilkin said after Sunday's defeat against Conference North side North Ferriby that he hoped to remain in charge. Wrexham's statement read: "Everyone at the club would like to thank Kevin for his endeavours during his time at the Wrexham FC, in particular reaching both the FA Trophy final and the third round of the FA Cup this season and his focus on developing links with the community." Wilkin succeeded Andy Morrell as Wrexham boss in April 2014. In 38 league games this season, Wrexham have won 13, drawn 12 and lost 13.